Taking home two TOBY Awards is a tremendous feat that both challenges and strengthens our property management teams as they work together in pursuit of that coveted trophy. To gain a deeper insight into the application process and the sentiments behind winning a TOBY, we interviewed some of the property managers who recently won the Regional TOBY Award. What we learned is that participating in this competition has a notable effect of enhancing property management team spirit and individual confidence. Because the competition touches every aspect of building management and operations, each member of the team becomes an important component and is integral to the success of the competition. 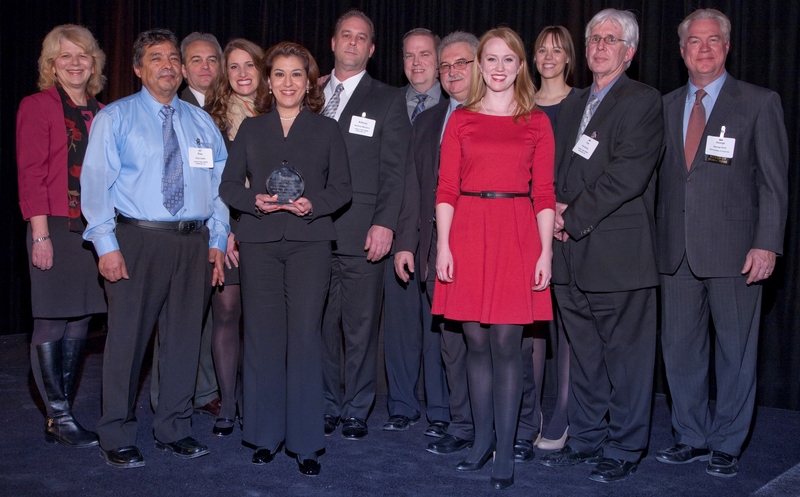 Teresa Amaro pictured with her 250 South Wacker Drive property management team. Susan Hammer, left, TOBY Subcommittee Co-Chair and George Kohl, right, President of BOMA/Chicago. Teresa Amaro, Real Estate Manager for CBRE at 250 South Wacker Drive, stated that each team member was involved in the TOBY process, including the janitors who made the building shine during the on-site visit and the engineers who paid attention to each detail. According to Amaro, the application process incites a profound sense of ownership for each team member and as a result, there is a major increase in team morale. 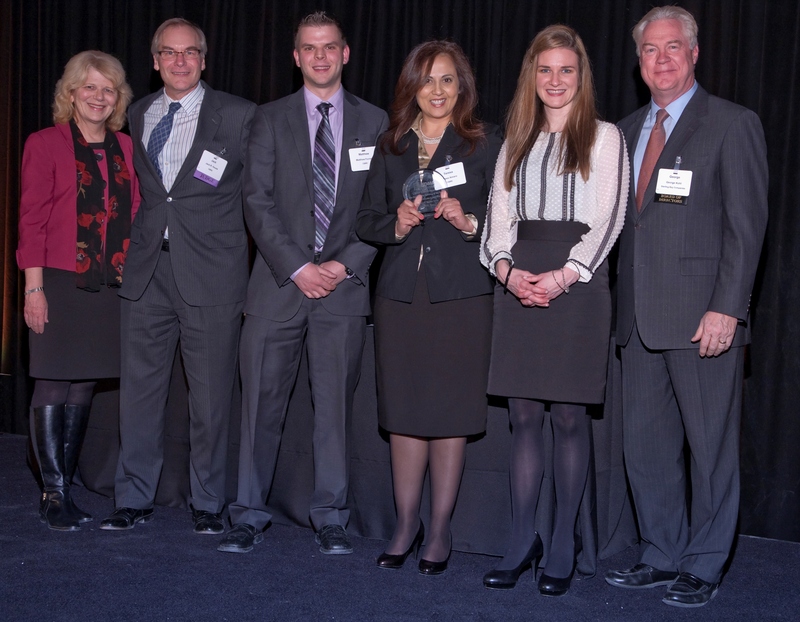 Myrna Coronado, General Manager for JLL at 77 West Wacker Drive, also noted that the application process was valuable in that it gracefully combined individual initiative with an overall team goal. Given the daunting amount of work it takes to enter the competition, BOMA/Chicago also asked our winners why they decided to enter. Loriann Duffy, General Manager for Hines at 300 North LaSalle, stated that her team applied for a TOBY because they wanted to capitalize on the hard work and cohesive team effort that they executed to earn the LEED Platinum certification in 2013. Duffy and her team jumped at yet another opportunity, a TOBY Award, where they could show their tenants and the real estate community that KBS and Hines are committed to sustainability. When we asked Amaro’s team why they applied, their answer was quite personal. 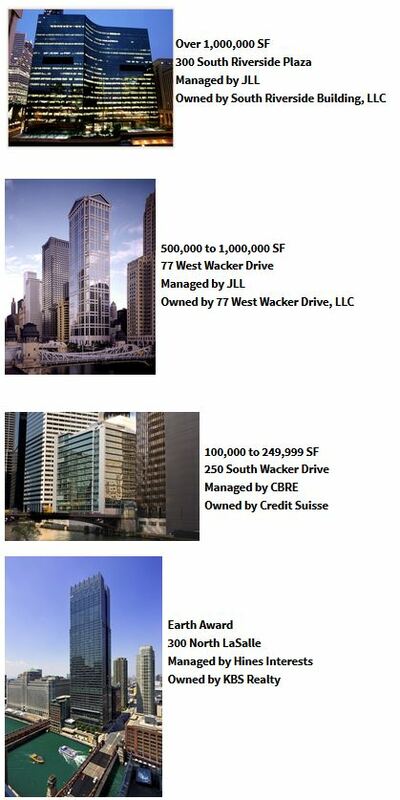 Amaro stated that 250 S. Wacker, a 16-story building that “sits among giants like Willis Tower,” is just as “awesome as those giants.” Her team wanted to put 250 S. Wacker on the map as a Class A, quality building. Coronado also had a specific answer to this question – her team has amazing sustainability and energy conservation programs that they wanted to showcase and use as a platform for operational excellence. Although applying for a TOBY gives you the opportunity to professionally boast about your building, the process is not without its challenges. According to Coronado, Duffy and Amaro, the biggest challenge is overcoming the vigorous documentation process along with concisely summarizing your building’s assets in a pre-determined word count. Myrna Coronado pictured with her 77 West Wacker Drive property management team.Susan Hammer, left, TOBY Subcommittee Co-Chair and George Kohl, right, President of BOMA/Chicago. But the challenges are not without the rewards. Coronado believes that whether or not you win the competition, the condition of the building and the teamwork that goes into the preparation is a big achievement on its own. She also stated that showcasing her building to the TOBY judges and the experience that comes from preparing for the review is priceless. Loriann Duffy: Focus on the key features of your property that will stand out among the crowd. Highlighting the best features of your building, and explaining their impact on both operations as well as sustainability, creates a clear and strong argument as to why your building is The Outstanding Building of the Year. Teresa Amaro: Organization and team-work is key. Organize your tenant event file, for example, throughout the year so that everything is in one place when you need it. Get your whole team involved and motivated. Print the TOBY scoring sheet months in advance and live by it. Myrna Coronado: The TOBY process is a team effort from start to finish. Allow team members to lead their own initiatives and promote their ideas – with proper guidance and leadership. There is accountability, pride and teamwork that allows for everyone to be part of something bigger. Louise Harney, General Manager at 300 S. Riverside: The international level competition is fierce and in many cases, one or two points separate the winner. At this level you do not have the opportunity to showcase your property to the team of judges via a property tour and on-site presentation, rather in narrative format. It is essential you address every question as concisely as possible to maintain the word limit, but also highlight what makes your property the best. Additionally, you should review the scoring sheets and comments the local judges provided as part of the local competition and incorporate their feedback. Now that these four teams have won a TOBY, all are in agreement that the award is much more than a shiny trophy. The biggest honor of winning a TOBY is that your industry peers look to you as the best-in-class. You are not taking home a trophy, you are taking home warranted recognition and pride in your team. Amaro stated that the positive energy from winning a TOBY award came out in how 250 S. Wacker interacted with tenants and vendors while Coronado stated that winning the award created a unified team atmosphere where the impossible became possible. But there are also more tangible results to earning this honor – you are able to promote your building as one of the best in the Midwest, attract tenants who make sustainable practices a priority and gain more visibility in the leasing community. This year’s local and regional winners once again prove that the TOBY award is not just a beauty contest. Winning a TOBY signifies management expertise. It becomes a symbol for years to come of your ability to operate a property at a peak level of financial performance for your owner and deliver a true value-enhanced occupancy to your rent paying tenants. Good luck to all of our Regional winners who will now proceed to the BOMA International TOBY Awards. International results will be announced at the BOMA International Conference in Orlando, FL on June 24, 2014 during the TOBY Awards Program & Banquet. Have questions on the TOBY process or want to leave a congratulatory message to our Regional winners? Share your thoughts by leaving a comment below.